I think we can all agree that this week’s greatest super-villain is this freezing weather. ‘Polar Vortex’ sounds like a comic book villain name which got me thinking about my favorite “cold” themed comic book characters. As members of the Justice League International in the late 80’s and early 90’s, the Scandinavian Tora Olafsdotte, AKA Ice, was often teamed with the Brazilian Beatriz Bonilla da Costa, AKA Fire. The sweet and innocent Ice was polar opposite in personality, as well as abilities, to the more vocal and vivacious Fire. This, along with Ice’s romance with Guy Gardner, created some of the most entertaining storylines of the DeMatteis and Giffen run on the title. She was later killed by Ocean Master, but since this is comics, she will probably be brought back to life before this list is even published. As with many of the Flash‘s rogues gallery members, Mark Mardon AKA Weather Wizard, has a bit of a convoluted past. He was a career criminal who acquired a wand that his scientist brother (who Mark may or may not have killed) that controls weather. Which I guess means he is not strictly a “cold themed” character. When DC Comics relaunched themselves with their New 52 initiative, many character origins were updated to be more modern and ethically diverse. Mark Mardon was changed to Marco Mardon and is now Latino. After Shapanka was shattered by the Hulk, a criminal named Donald Gill acquired one of his suits and had many battles with various Marvel heroes, such as Spider-Man. Now there is a 3rd dude running around in the suit. I guess the suit is made from a one-size-fits-all material. DC\’s Legends Of Tomorrow — Image Number: LGN01_COLD_V5.jpg — Pictured: Wentworth Miller as Leonard Snart/Captain Cold — Photo: Brendan Meadows/The CW — ÃÂ© 2015 The CW Network, LLC. All rights reserved. Len Snart, AKA Captain Cold, has been terrorizing the Flash in the DC Comics for years, but has gained a ton of popularity recently with Wentworth Miller‘s portrayal of this villain with a moral code in the CW’s Arrowverse. Miller’s Captain Cold was often paired with with Dominic Purcell‘s Heatwave in the Arrowverse, similar to the previously mentioned Fire and Ice. The two actors had a terrific on screen chemistry, dating back to their days on Fox’s hit show Prison Break. Another villain that has had multiple characters carry the mantle, Icicle II has always been one of my favorite villains. The original Icicle character dates all the way back to 1947 when he took on the original Green Lantern with a freeze gun. The current Icicle, Cameron, is the son of the original Icicle who has been mutated due to prolonged exposure to the radiation from his dad’s freeze gun. I am somewhat bending my own rules again here with another not strictly “cold themed” character by including the most famous former Egyptian orphan in comic book history: Storm. With the mutant power to control weather, Storm has the ability to weaponize ice, snow or sleet against her enemies. Bobby Drake, AKA Iceman, was one of the original X-men who appeared in X-Men issue #1 back in 1963 and has been a staple of the Marvel Comics universe ever since. Iceman has the mutant ability to manipulate water vapor around him to create ice and freezing cold. Laufey, who was the King of the Frost Giants and ruler of the frozen lands of Jotunheim, was slain by Thor’s father Odin. He is was also the biological father of Loki, The Prince of Lies. After Odin killed Laufey (who has since been brought back to life because, you know, comics), he found the baby Loki, took him and raised him as his own. Batman has the strongest and most well developed rogues gallery of villains in all of comics and one of the top characters in the gallery is Victor Freeze. Mr. Freeze has appeared in all forms of Batman media, included the campy 60’s T.V. show, the current hit Fox show Gotham and (my favorite) the 90’s Batman: The Animated Series. Full disclosure: I pretend that the Arnold Schwarzenegger Mr. Freeze never happened. 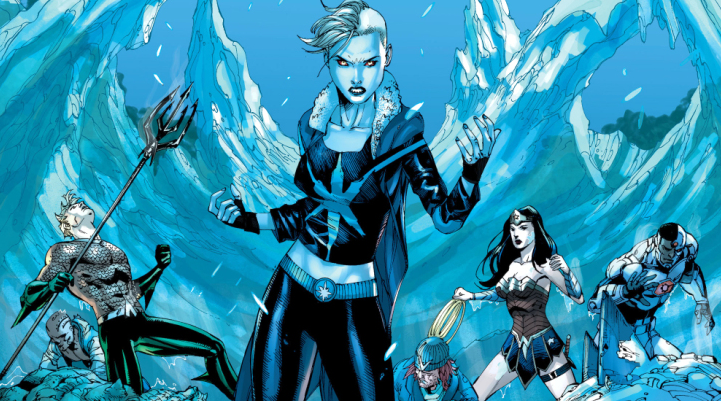 The third member of the Flash’s rogues gallery to appear on this list is the coolest and hottest: Killer Frost! Also, like many characters on this list, multiple women in the DC universe have carried the persona of Killer Frost. The most recent being S.T.A.R. Labs scientist Caitlin Snow, appearing in the CW TV series and the New 52 reboot in the DC comics. I hard a hard time deciding whether to include this character in my Top Ten or not. But then I remembered this is my list and I can do whatever I want, so I included Jack Frost as a bonus character. Jack Frost was one of the late Stan “The Man” Lee’s first super-hero creations, first appearing in 1941. He was also the very first ‘cold’ themed comic book character. Frost carried one of the tropes that Lee would later use on many of his most famous creations: An outcast misunderstood by society. I first learned about Jack Frost when I picked up Captain America issue 384 as a kid, assuming it was the X-Men’s Iceman on the cover (pictured below). I enjoyed the story of Frost and Cap re-uniting and reminiscing about their WWII days fighting the Axis Powers. What did you think of our list of “cold themed” comic book characters? What characters did I miss that would have made your list? What a fun idea for a post! I love all of these super heroes and villains! I don’t really read any comic books, but I have heard of Storm! HAHA! This is a fun post during this HORRIBLY cold weather! I am so showing this to my husband, he used to be a fan when younger of comics and he was just telling our son what they are and wanted to get him some to read. I don’t know if our son will like them but just having an interest will make my hubby happy. love captain cold, killer frost, and storm! great idea to talk about the cold guys during this horrid weather! Storm was one of my favs growing up! I don’t know much about Killer Frost, but I’m intrigued! loved this idea 🙂 and CWs Arrow and Flash are among my favorite shows so Killer Frost and Captain Cold – yes! my son will love this and I’m excited to show him and seem in the know about all the icey superhero villains!